A simple note on Programming. Remarks: It's a very simple note on development environments: A Helicopter View (sort of). The subject is as wide as "Planet Earth" itself, so to speak. For example, you can go "in depth"
to reach senior level. Or, one is totally involved in Interfacing, or Artificial Intelligence etc.. etc.. Knowledge is always a combination of literature, lots of articles, and ofcourse experience (having done projects). and don't take it too literally). However, an approach as a large series of "quickstarts", might not be a bad idea. might not be bad too. In short: what about a rather "holistic" document, touching a lot of stuff? Ofcourse, then such an approach can never display enough substance on a certain subject. But a sort of helicoper tour is possible, surely. is namely so large, that the "target" here is quite impossible. I don't think so. Anyway..., I like the idea. I am simply going to do it. So, it will cover a lot of terrain, but in a non-detailed way. an enormous demand for developers in all sorts of businesses and branches. If I could contribute something usefull to a "newcomer", that would be more than outstanding. 1. A perspective from the Operating System. 1.1 User space and Kernel space. ofcourse can be from any domain (like scientific applications). is handled by calling a service or function from the Operating system. which form a layer between the application and the Operating System. On many machines, the most fundamental API is synonym to the "System Call Interface". like IO, memory management and the like. Fig 1: Just an illustration of a perspective from a generic OS. The figure above, is quite generic. It can model most general purpose Operating Systems. they either perform privileged instructions themselves, or call them directly from other modules. to IO, memory and other devices, they are called "privileged". to access those fundamental devices themselves: they must use the services of the Operating System. I hope that this theory, shows a bit from figure 1. To make the various API's a bit more concrete, we can take a look at a modern Windows Operating System. Please take a look at this file (only the first image is important). Here you can see various API's, forming indeed an "interface" for various user mode programs. which together provide a wealth of callable functions and procedures (dll's like user32.dll, GDI32.dll etc..). 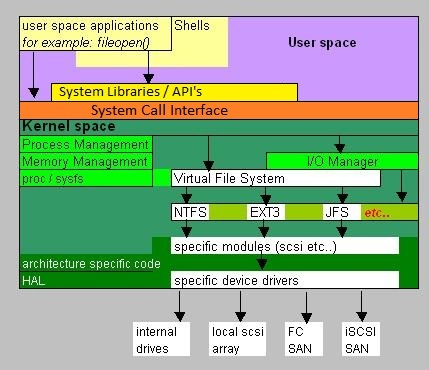 the true System Call Interface directly (ntdll.dll). on a specific view on Applications (or modules), namely "user mode" and "kernel mode". Ofcourse, this also depends on which OS you want to run your program. platforms in this note. Needless to say that there exists many other platforms as well. Anyway, on Linux, the "ELF" format is often used as the internal format of a binary executable. On Windows, the "PE" format is the common format of a binary executable. These are however not only formats in use. compilers, before .NET became popular. Such files have several headers and several sections, as they are structured in the file. Section might be labeled as ".text", and these ones actually contains code. Other sections are called ".data" and are reserved for variables, which the code will use. Some headers will contain the metadata, how to load and reserve memory of such sections. for the 32- and 64 bits platforms, resepctively. if you would indeed to try to run it from 16 bit DOS. Then, the loading would terminate. From running from Windows, the DOS stub is followed by a pointer to the PE header. but for the loader it contains information on which subsystem this executable should run. Thats just an example. has the property "The section is not pageable". Many of such properties are listed. The main points is: All PE files have a set of headers, followed by a set of sections. is loaded with the address as listed in the "AddressOfEntryPoint" field in the PE header.